The CurrencyShares® Chinese Renminbi Trust (the Trust) was formed under the laws of the State of New York on August 16, 2011. On August 16, 2011, Guggenheim Specialized Products, LLC d/b/a Guggenheim Investments (the Sponsor) deposited 500 Chinese Yuan in the Trusts primary deposit account held by JPMorgan Chase Bank, N.A., London Branch (the Depository). The Sponsor is a Delaware limited liability company whose sole member is Security Investors, LLC (also d/b/a Guggenheim Investments). The Sponsor is responsible for, among other things, overseeing the performance of The Bank of New York Mellon (the Trustee) and the Trusts principal service providers, including the preparation of financial statements. The Trustee is responsible for the day-to-day administration of the Trust. The investment objective of the Trust is for the Trusts shares (the Shares) to reflect the price in U.S. Dollars (USD) of the Chinese Renminbi plus accrued interest, if any, less the Trusts expenses and liabilities. The Shares are intended to provide investors with a simple, cost-effective means of gaining investment benefits similar to those of holding Chinese Renminbi. The Trusts assets primarily consist of Chinese Renminbi on demand deposit in two deposit accounts maintained by the Depository: a primary deposit account which may earn interest and a secondary deposit account which does not earn interest. The secondary deposit account is used to account for any interest that may be received and paid out on creations and redemptions of blocks of 50,000 Shares (Baskets). The secondary account is also used to account for interest earned, if any, on the primary deposit account, pay Trust expenses and distribute any excess interest to holders of Shares (Shareholders) on a monthly basis. The accompanying unaudited financial statements were prepared in accordance with accounting principles generally accepted in the United States of America for interim financial information and with the instructions for Form 10-Q. In the opinion of management, all material adjustments, consisting only of normal recurring adjustments, considered necessary for a fair statement of the interim period financial statements have been made. Interim period results are not necessarily indicative of results for a full-year period. These financial statements and the notes thereto should be read in conjunction with the Trusts financial statements included in the Form 10-K as filed on January 11, 2018. The preparation of financial statements in conformity with accounting principles generally accepted in the United States of America requires management to make estimates and assumptions that affect the reported amounts of the assets, liabilities and disclosures of contingent liabilities at the date of the financial statements, the reported amounts of revenue and expenses during the period and the evaluation of subsequent events through the issuance date of the financial statements. Actual results could differ from those estimates. The Trustee calculates the Trusts net asset value (NAV) each business day, as described in Note 4. For NAV calculation purposes, Chinese Renminbi deposits (cash) are translated at the Closing Spot Rate, which is the Chinese Renminbi /USD exchange rate as determined and published by The WM Company at 4:00 PM (London time/London fixing) on each day that NYSE Arca, Inc. (NYSE Arca) is open for regular trading. The functional currency of the Trust is the Chinese Renminbi in accordance with generally accepted accounting standards. For financial statement reporting purposes, the U.S. Dollar is the reporting currency. As a result, the financial records of the Trust are translated from Chinese Renminbi to USD. The Closing Spot Rate on the last day of the period is used for translation in the statements of financial condition. The average Closing Spot Rate for the period is used for translation in the statements of comprehensive income and the statements of cash flows. Any currency translation adjustment is included in comprehensive income. The Trust is treated as a grantor trust for federal income tax purposes and, therefore, no provision for federal income taxes is required. Interest, gains and losses are passed through to the Shareholders. Shareholders generally will be treated, for U.S. federal income tax purposes, as if they directly owned a pro-rata share of the assets held in the Trust. Shareholders also will be treated as if they directly received their respective pro-rata portion of the Trusts income, if any, and as if they directly incurred their respective pro-rata portion of the Trusts expenses. The acquisition of Shares by a U.S. Shareholder as part of a creation of a Basket will not be a taxable event to the Shareholder. The Sponsors fee accrues daily and is payable monthly. For U.S. federal income tax purposes, an accrual-basis U.S. 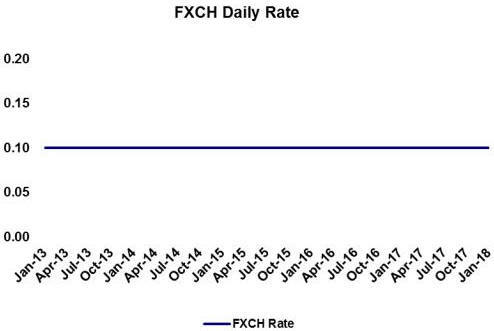 Shareholder generally will be required to take into account as an expense its allocable portion of the USD-equivalent of the amount of the Sponsors fee that is accrued on each day, with such USD-equivalent being determined by the currency exchange rate that is in effect on the respective day. To the extent that the currency exchange rate on the date of payment of the accrued amount of the Sponsors fee differs from the currency exchange rate in effect on the day of accrual, the U.S. Shareholder will recognize a currency gain or loss for U.S. federal income tax purposes. The Trust does not expect to generate taxable income except for interest income (if any) and gain (if any) upon the sale of Chinese Renminbi. A non-U.S. Shareholder generally will not be subject to U.S. federal income tax with respect to gain recognized upon the sale or other disposition of Shares, or upon the sale of Chinese Renminbi by the Trust, unless: (1) the non-U.S. Shareholder is an individual and is present in the United States for 183 days or more during the taxable year of the sale or other disposition, and the gain is treated as being from United States sources; or (2) the gain is effectively connected with the conduct by the non-U.S. Shareholder of a trade or business in the United States. A non-U.S. Shareholders portion of any interest income earned by the Trust generally will not be subject to U.S. federal income tax unless the Shares owned by such non-U.S. Shareholder are effectively connected with the conduct by the non-U.S. Shareholder of a trade or business in the United States. Interest on the primary deposit account, if any, accrues daily as earned and is received or paid on a monthly basis. Any interest below zero for the period is reflected as interest expense. To the extent that the interest earned by the Trust, if any, exceeds the sum of the Sponsors fee for the prior month plus other Trust expenses, if any, the Trust will distribute, as a dividend (herein referred to as dividends or distributions), the excess interest earned in Chinese Renminbi effective on the first business day of the subsequent month. The Trustee will direct that the excess Chinese Renminbi be converted into USD at the prevailing market rate and the Trustee will distribute the USD as promptly as practicable to Shareholders on a pro-rata basis (in accordance with the number of Shares that they own). Chinese Renminbi principal deposits are held in a Chinese Renminbi-denominated, interest-bearing demand account. The Chinese Yuan is the unit of account for the Chinese Renminbi. For the three months ended January 31, 2018, there were no Chinese Yuan principal deposits, no Chinese Yuan principal redemptions and Chinese Yuan withdrawals (to pay expenses) of 36,951, resulting in an ending Chinese Yuan principal balance of 49,077,176. This equates to 7,797,082 USD. For the year ended October 31, 2017, there were no Chinese Yuan principal deposits, no Chinese Yuan principal redemptions and Chinese Yuan withdrawals (to pay expenses) of 146,828, resulting in an ending Chinese Yuan principal balance of 49,114,127. This equates to 7,406,019 USD. Net interest, if any, associated with creation and redemption activity is held in a Chinese Renminbi-denominated non-interest-bearing account, and any balance is distributed in full as part of the monthly income distributions, if any. Shares are classified as redeemable for financial statement purposes, since they are subject to redemption. Shares are issued and redeemed continuously in Baskets in exchange for Chinese Renminbi. Individual investors cannot purchase or redeem Shares in direct transactions with the Trust. Only Authorized Participants (as defined below) may place orders to create and redeem Baskets. An Authorized Participant is a Depository Trust Company (DTC) participant that is a registered broker-dealer or other institution eligible to settle securities transactions through the book-entry facilities of the DTC and which has entered into a contractual arrangement with the Trust and the Sponsor governing, among other matters, the creation and redemption process. Authorized Participants may redeem their Shares at any time in Baskets. Due to expected continuing creations and redemptions of Baskets and the two-day period for settlement of each creation or redemption, the Trust reflects Shares created as a receivable on the trade date. Shares redeemed are reflected as a liability on the trade date. Outstanding Shares are reflected at a redemption value, which is the NAV per Share at the period end date. Adjustments to redeemable capital Shares at redemption value are recorded against retained earnings or, in the absence of retained earnings, by charges against the cumulative translation adjustment. The Trustee calculates the Trusts NAV each business day. To calculate the NAV, the Trustee subtracts the Sponsors accrued fee through the previous day from the Chinese Renminbi held by the Trust (including all unpaid interest, if any, accrued through the preceding day) and calculates the value of the Chinese Renminbi in USD based upon the Closing Spot Rate. If, on a particular evaluation day, the Closing Spot Rate has not been determined and announced by 6:00 PM (London time), then the most recent Closing Spot Rate will be used to determine the NAV of the Trust unless the Trustee, in consultation with the Sponsor, determines that such price is inappropriate to use as the basis for the valuation. If the Trustee and the Sponsor determine that the most recent Closing Spot Rate is not an appropriate basis for valuation of the Trusts Chinese Renminbi, they will determine an alternative basis for the valuation. The Trustee also determines the NAV per Share, which equals the NAV of the Trust, divided by the number of outstanding Shares. Shares deliverable under a purchase order are considered outstanding for purposes of determining NAV per Share; Shares deliverable under a redemption order are not considered outstanding for this purpose. The Sponsors fee accrues daily at an annual nominal rate of 0.40% of the Chinese Renminbi in the Trust (including all unpaid interest but excluding unpaid fees, each as accrued through the immediately preceding day) and is paid monthly. The Sponsor assumes and pays the following administrative and marketing expenses incurred by the Trust: the Trustees monthly fee, NYSE Arca listing fees, SEC registration fees, typical maintenance and transaction fees of the Depository, printing and mailing costs, audit fees and expenses, up to $100,000 per year in legal fees and expenses, and applicable license fees. In certain exceptional cases the Trust will pay for some expenses in addition to the Sponsors fee. These exceptions include expenses not assumed by the Sponsor (i.e., expenses other than those identified in the preceding paragraph), expenses resulting from a negative interest rate, taxes and governmental charges, expenses and costs of any extraordinary services performed by the Trustee or the Sponsor on behalf of the Trust or action taken by the Trustee or the Sponsor to protect the Trust or the interests of Shareholders, indemnification of the Sponsor under the Depositary Trust Agreement, audit fees and legal expenses in excess of $100,000 per year. The Sponsor is a related party of the Trust. The Sponsor oversees the performance of the Trustee and the Trusts principal service providers, including the preparation of financial statements, but does not exercise day-to-day oversight over the Trustee or the Trusts service providers. All of the Trusts assets are Chinese Renminbi, which creates a concentration risk associated with fluctuations in the price of the Chinese Renminbi. 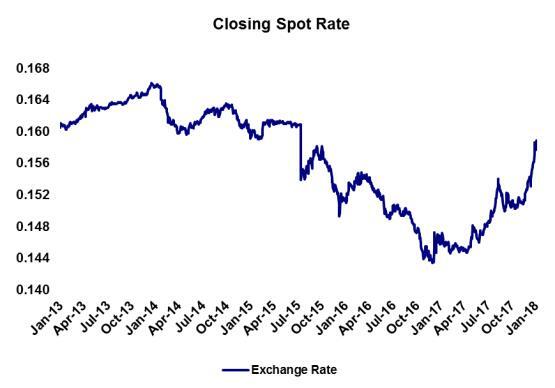 Accordingly, a decline in the Chinese Renminbi to USD exchange rate will have an adverse effect on the value of the Shares. Factors that may have the effect of causing a decline in the price of the Chinese Renminbi include national debt levels and trade deficits, domestic and foreign inflation rates, domestic and foreign interest rates, investment and trading activities of institutions and global or regional political, economic or financial events and situations. Substantial sales of Chinese Renminbi by the official sector (central banks, other governmental agencies and related institutions that buy, sell and hold Chinese Renminbi as part of their reserve assets) could adversely affect an investment in the Shares. All of the Trusts Chinese Renminbi are held by the Depository. Accordingly, a risk associated with the concentration of the Trusts assets in accounts held by a single financial institution exists and increases the potential for loss by the Trust and the Trusts beneficiaries in the event that the Depository becomes insolvent. Under the Trusts organizational documents, the Sponsor is indemnified against any liability or expense it incurs without negligence, bad faith or willful misconduct on its part. The Trusts maximum exposure under this arrangement is unknown, as this would involve future claims that may be made against the Trust that have not yet occurred. On September 28, 2017, Guggenheim Capital LLC entered into an agreement to sell its exchange-traded funds business to Invesco Ltd. (Invesco), a leading independent global investment management company (the Transaction). In connection with the Transaction, Invesco will acquire 100% of the issued and outstanding membership interests of Guggenheim Specialized Products, LLC, the sponsor of the Trust. The Transaction is expected to close in the second quarter of 2018. This report contains forward-looking statements within the meaning of the Private Securities Litigation Reform Act of 1995. Forward-looking statements can be identified by words such as anticipate, expect, intend, plan, believe, seek, outlook and estimate and other similar words. Forward-looking statements are based upon our current expectations and beliefs concerning future developments and their potential effects on us. Such forward-looking statements are not guarantees of future performance. Various factors may cause our actual results to differ materially from those expressed in our forward-looking statements. 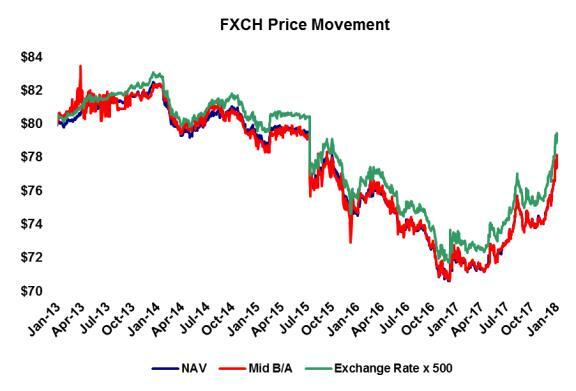 These factors include fluctuations in the price of the Chinese Renminbi, as the value of the Shares relates directly to the value of the Chinese Renminbi held by the Trust and price fluctuations could materially adversely affect an investment in the Shares. Readers are urged to review the Risk Factors section contained in the Trusts most recent annual report on Form 10-K for a description of other risks and uncertainties that may affect an investment in the Shares. Neither Guggenheim Specialized Products, LLC d/b/a Guggenheim Investments (the Sponsor) nor any other person assumes responsibility for the accuracy or completeness of forward-looking statements contained in this report. The forward-looking statements are made as of the date of this report, and will not be revised or updated to reflect actual results or changes in the Sponsors expectations or predictions. The CurrencyShares® Chinese Renminbi Trust (the Trust) is a grantor trust that was formed on August 16, 2011. The Trust issues shares (the Shares) in blocks of 50,000 (a Basket) in exchange for deposits of Chinese Renminbi and distributes Chinese Renminbi in connection with the redemption of Baskets. The Shares began trading on NYSE Arca under the ticker symbol FXCH on October 4, 2011. The investment objective of the Trust is for the Shares to reflect the price of the Chinese Renminbi plus accrued interest, if any, less the expenses of the Trusts operations. The Shares are intended to offer investors an opportunity to participate in the market for the Chinese Renminbi through an investment in securities. The Shares are intended to provide institutional and retail investors with a simple, cost-effective means of gaining investment benefits similar to those of holding the Chinese Renminbi. The Shares are bought and sold on NYSE Arca like any other exchange-listed security. The Shares are backed by the assets of the Trust, which does not hold or use derivative products. The Trust is a passive investment vehicle and does not have any officers, directors or employees. The Trust does not engage in any activities designed to obtain profit from, or ameliorate losses caused by, changes in the price of the Chinese Renminbi. Investing in the Shares does not insulate the investor from certain risks, including price volatility. The Trustee calculates, and the Sponsor publishes, the Trusts Net Asset Value (NAV) each business day. To calculate the NAV, the Trustee adds to the amount of Chinese Renminbi in the Trust at the end of the preceding day accrued but unpaid interest, Chinese Renminbi receivable under pending purchase orders and the value of other Trust assets, and subtracts the accrued but unpaid Sponsors fee, Chinese Renminbi payable under pending redemption orders and other Trust expenses and liabilities, if any. The NAV is expressed in USD based on the Chinese Renminbi/USD exchange rate as determined by The WM Company as of 4:00 PM (London time / London fixing) (the Closing Spot Rate) on each day that NYSE Arca is open for regular trading. If, on a particular evaluation day, the Closing Spot Rate has not been determined and announced by 6:00 PM (London time), then the most recent Closing Spot Rate is used to determine the NAV of the Trust unless the Trustee, in consultation with the Sponsor, determines that such price is inappropriate to use as the basis for the valuation. The Trustee also determines the NAV per Share, which equals the NAV of the Trust divided by the number of outstanding Shares. The NAV of the Trust and NAV per Share are published by the Sponsor on each day that NYSE Arca is open for regular trading and are posted on the Trusts website, www.currencyshares.com. In exchange for a fee, the Sponsor bears most of the expenses incurred by the Trust. As a result, the only ordinary expense of the Trust during the period covered by this report was the Sponsors fee. Each month the Depository deposits into the secondary deposit account accrued but unpaid interest, if any, and the Trustee withdraws Chinese Renminbi from the secondary deposit account to pay the accrued Sponsors fee for the previous month plus other Trust expenses, if any. When the interest deposited, if any, exceeds the sum of the Sponsors fee for the prior month plus other Trust expenses, if any, the Trustee converts the excess into USD at the prevailing market rate and distributes the USD as promptly as practicable to Shareholders on a pro-rata basis (in accordance with the number of Shares that they own). The Trust did not make any distributions during the quarter ended January 31, 2018. The preparation of financial statements in conformity with accounting principles generally accepted in the United States of America requires the Sponsors management to make estimates and assumptions that affect the reported amounts of the assets and liabilities and disclosures of contingent liabilities at the date of the financial statements and the reported amounts of revenue and expenses during the period covered by this report. In addition to the description below, please refer to Note 2 to the financial statements for further discussion of our accounting policies. The functional currency of the Trust is the Chinese Renminbi in accordance with ASC 830, Foreign Currency Translation. The Chinese Yuan is the unit of account for the Chinese Renminbi. As of October 31, 2017, the number of Chinese Yuan owned by the Trust was 49,114,127, resulting in a redeemable capital share value of $7,404,141. During the three months ended January 31, 2018, no additional Shares were created and no additional Shares were redeemed. In addition, 36,951 Chinese Yuan were withdrawn to pay the portion of the Sponsors fee that exceeded the interest earned. As of January 31, 2018, the number of Chinese Yuan owned by the Trust was 49,077,176, resulting in a redeemable capital Share value of $7,795,104. An increase in the Trusts redeemable capital share value from $7,404,141 at October 31, 2017 to $7,795,104 at January 31, 2018 was primarily the result of an increase in the Closing Spot Rate from 0.15079 at October 31, 2017 to 0.15887 at January 31, 2018. Interest income increased from $1,828 for the three months ended January 31, 2017 to $1,916 for the three months ended January 31, 2018, attributable primarily to an increase in the Closing Spot Rate as set forth in the Closing Spot Rate chart shown previously. The Sponsors fee accrues daily at an annual nominal rate of 0.40% of the Chinese Renminbi in the Trust. Due primarily to an increase in the Closing Spot Rate, the Sponsors fee increased from $7,211 for the three months ended January 31, 2017 to $7,558 for the three months ended January 31, 2018. The only expense of the Trust during the three months ended January 31, 2018 was the Sponsors fee. The Trusts net loss for the three months ended January 31, 2018 was $5,642 due to the Sponsors fee of $7,558 exceeding interest income of $1,916. Cash dividends were not paid by the Trust for the three months ended January 31, 2017 or the three months ended January 31, 2018 as the Trusts interest income did not exceed the Trusts expenses during those periods. Except as described above with respect to fluctuations in the Chinese Renminbi/USD exchange rate and changes in the nominal annual interest rate paid by the Depository on Chinese Renminbi held by the Trust, the Trust is not subject to market risk. The Trust does not hold securities and does not invest in derivative products. The Trust maintains disclosure controls and procedures (as defined in Rules 13a-15(e) and 15d-15(e) under the Securities Exchange Act of 1934) designed to ensure that material information relating to the Trust is recorded, processed and disclosed on a timely basis. The Trusts disclosure controls and procedures are designed by or under the supervision of the Sponsors chief executive officer and chief financial officer, who exercise oversight over the Trust as the Trust has no officers. The chief executive officer and chief financial officer of the Sponsor have evaluated the effectiveness of the Trusts disclosure controls and procedures as of January 31, 2017. Based on that evaluation, the chief executive officer and chief financial officer of the Sponsor have concluded that the disclosure controls and procedures of the Trust were effective as of the end of the period covered by this report. There were no changes in the Trusts internal control over financial reporting that occurred during the Trusts last fiscal quarter that have materially affected, or are reasonably likely to materially affect, the Trusts internal control over financial reporting. There have been no material changes from the risk factors disclosed in the Risk Factors section of the Trusts Annual Report on Form 10-K filed with the Securities and Exchange Commission on January 11, 2018. 3.1 Certificate of Formation of Guggenheim Specialized Products, LLC dated September 14, 2005, incorporated herein by reference to Exhibit 3.1 to the Registration Statement on Form S-1 (File No. 333-174640) filed by the Trust on June 1, 2011. 3.2 Amendment to Certificate of Formation of Guggenheim Specialized Products, LLC dated March 27, 2012, incorporated herein by reference to Exhibit 3.2 to the Annual Report on Form 10-K filed by the Trust on January 14, 2013. 3.3 Limited Liability Company Agreement of Guggenheim Specialized Products, LLC, incorporated herein by reference to Exhibit 3.2 to the Registration Statement on Form S-1 (File No. 333-174640) filed by the Trust on June 1, 2011. 4.1 Depositary Trust Agreement dated as of August 16, 2011 between Guggenheim Specialized Products, LLC and The Bank of New York Mellon, incorporated herein by reference to Exhibit 4.1 to Amendment No. 2 to the Registration Statement on Form S-1/A (File No. 333-174640) filed by the Trust on August 25, 2011. 4.2 Global Amendment to Depositary Trust Agreements dated as of March 6, 2012 between Guggenheim Specialized Products, LLC and The Bank of New York Mellon, incorporated herein by reference to Exhibit 4.1 to the Quarterly Report on Form 10-Q filed by the Trust on March 12, 2012. 4.3 Participant Agreement dated as of September 13, 2011 among Merrill Lynch Professional Clearing Corp., The Bank of New York Mellon, as Trustee, and Guggenheim Specialized Products, LLC (together with Schedule pursuant to Instruction 2 to Item 601 of Regulation S-K), incorporated herein by reference to Exhibit 4.3 to the Annual Report on Form 10-K filed by the Trust on January 14, 2014. 4.4 Form of Participant Agreement among The Bank of New York Mellon, Guggenheim Specialized Products, LLC, and the Authorized Participants listed in the Schedule attached thereto pursuant to Instruction 2 to Item 601 of Regulation S-K, incorporated herein by reference to Exhibit 4.4 to the Post-Effective Amendment No. 1 to the Registration Statement on Form S-1 filed by the Trust on January 14, 2016. 4.5 Global Amendment to Depositary Trust Agreements dated as of September 5, 2017 between Guggenheim Specialized Products, LLC and The Bank of New York Mellon, incorporated herein by reference to Exhibit 4.5 to the Quarterly Report on Form 10-Q filed by the Trust on September 11, 2017. 10.1 Sublicense Agreement dated as of June 1, 2011 between Security Investors, LLC and Guggenheim Specialized Products, LLC, , incorporated herein by reference to Exhibit 10.1 to the Registration Statement on Form S-1 (File No. 333-174640) filed by the Trust on June 1, 2011. 10.2 Deposit Account Agreement dated as of August 16, 2011 between The Bank of New York Mellon, as Trustee, and JPMorgan Chase Bank, N.A., London Branch, as Depository, incorporated herein by reference to Exhibit 10.2 to Amendment No. 2 to the Registration Statement on Form S-1/A (File No. 333-174640) filed by the Trust on August 25, 2011. 31.1 Certification by Principal Executive Officer pursuant to Section 302(a) of the Sarbanes-Oxley Act of 2002. 31.2 Certification by Principal Financial Officer pursuant to Section 302(a) of the Sarbanes-Oxley Act of 2002. 32.1 Certification by Principal Executive Officer pursuant to 18 U.S.C. Section 1350, as adopted pursuant to Section 906 of the Sarbanes-Oxley Act of 2002. 32.2 Certification by Principal Financial Officer pursuant to 18 U.S.C. Section 1350, as adopted pursuant to Section 906 of the Sarbanes-Oxley Act of 2002.